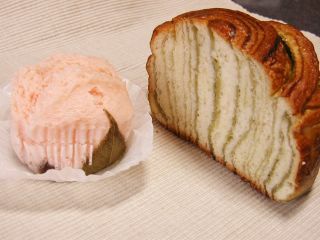 These two kinds of bread caught my eyes at the nearby bakery today. 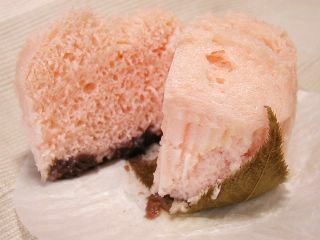 I knew the pink one was “Sakura (cherry blossom) mushipan (steamed cakebread),” which is my favorite. Usually they sell sakura mushipan in the cherry-blossom season only, so I don’t hesitate to buy one when I find them on the shelf. 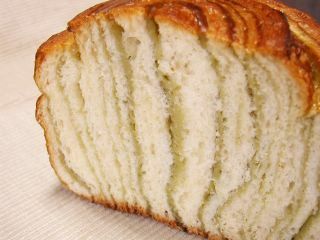 When I read the tag, I found that the green stripes were matcha cream. 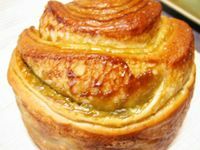 Boy, it must be some work to make the matcha cream look this way. And this Sakura mushipan ! The mushipan is very soft, and the anko (sweet azuki -bean paste) at the bottom adds some, not too much sweetness, which is wonderful! What I like the best is, however, the salted cherry leaf at the bottom. It has a very distinctive flavor, and to tell the truth, I hated it when I was a kid. At that time I never saw Sakura mushipan around, but Sakuramochi was already very popular. I still remembet the first time I tried a salt-preserved cherry leaf. When I was eating a sakuramochi, my grandma told me to eat the leaf, too. I thought she was kidding, but she insisted and promised me it would taste good, so I gave it a try. And I hated it. I just spitted it out and was mad at her for the rest of the day. 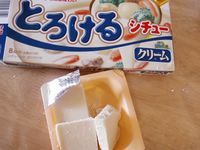 Well, my preference changed as I grew up and now I love the combination of lightly sweetened mushipan (or mochi or whatever), sweet bean paste and the salty cherry leaf so much. The taste of the cherry leaf always reminds me of my grandma’s gnarled fingers (because after that incident I made her remove cherry leaf from sakuramochi every time I ate one). 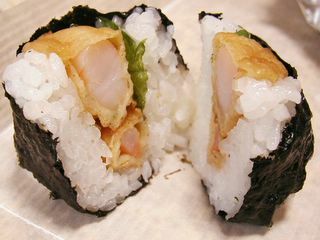 When I was younger, I thought tenmusu (rice ball with batter-fried shrimp inside) was a real unfamiliar food. 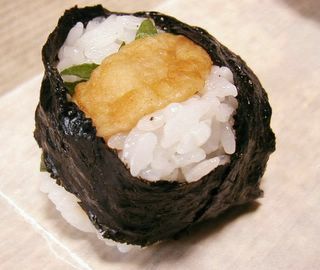 The idea of putting batter-fried food in a rice ball sounded so strange to me. I thought that deep-fried batter would taste greasy and awful, and would never go well with the rice. It was after I turned 20 years old when I tasted tenmusu for the first time. And guess what? I liked it!! Maybe It was largely because I grew to love green perilla by then. The green perilla is just wonderful in tenmusu, I think. 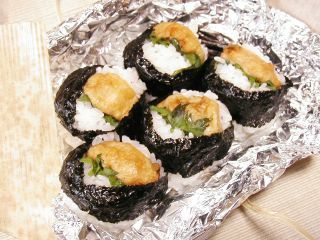 Its refreshing flavor cancels out the greasiness and goes well with the nori (dried seaweed). I like these tenmusu from the shop, but more green perilla leaves and more salt would make them even better, I think. 1. 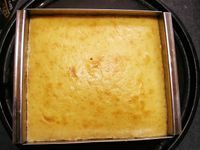 Making a square-shaped cake. Japanese birthday cakes are usually round, but I miss the kind of cakes I had in the U.S…. 2. 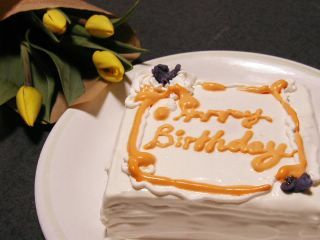 Writing “Happy Birthday ” on a cake. It sounds like something you can do anytime, but actually, I haven’t done it before. 3. Using “sugared violet” for garnishing a cake. I saw “sugard violet ” in a baking book when I was a kid and got charmed by it. It just sounded so romantic! 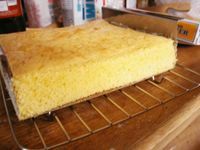 In order to give a little extra flavor to the cake, I added a little grated orange rind and orange juice when making the cake batter. 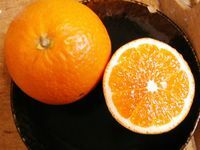 I used “Kiyomi” orange, which is said to be the hybrid of tangerine and trovita oranges. 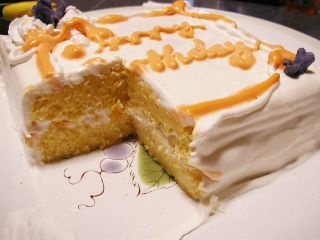 To be perfectly honest, it made the cake a little heavy, but I loved the orange flavor! 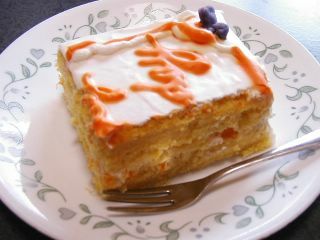 It was really a big challenge for me, but I did slice the cake in half and sandwiched whipped cream and flesh of Kiyomi orange. Now I have to confess that I’m not good at handling cream at all. It always takes so long for me to whip cream, even though I use a lot of ice cubes to cool it while whipping, and I get tired. Especially this time, the orange-colored one was runny no matter how hard I whipped, probably because of the tiny amount of water I added to dissolve the food coloring powder and orange curacao? Anyway, I’m not going to tell you how long it took for me to decorate this cake, but finally!! I managed to smooth the surface and wrote “Happy Birthday” on it. 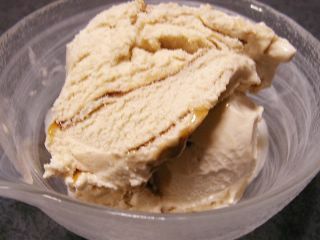 When I put the sugared violet on the cream, I had a great feeling of accomplishment. It did NOT turn out exactly as I had dreamed of, but at least I tried out everything I had been dreaming of. It is nice to know that someone (even it was myself) spent so much time and effort for my birthday, after all. A Big Piece for myself, of course. So this is my XXth birthday, folks. BTW, I tasted the sugared violet for the first time in my life, and it’s amazing! I expected it to be just sugar-sweet with no particular flavor, but it does have very distinctive flavor!! I wonder if the flavor was artificially added… or is it something that naturally comes from the violet??? Hmmmmm…. I love it! It tastes so good with nice black tea. Guess what this is? It’s rhubarb sprout. 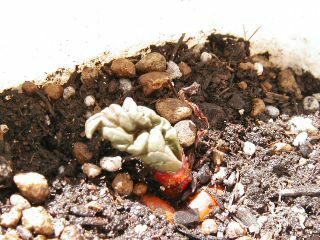 My rhubarb seemed completely dead at the end of November last year, but today I noticed that it was alive!!! This is my favorite dish that I often make before my pay day. In Japan, bean sprouts are SO cheap. Of course, that is not the only reason that I love this stir-fry dish. I just love the crunchiness of the bean sprouts. For dessert, I had a blueberry muffin that a friend of mine gave me yesterday. The blueberries in the muffin tasted so good. 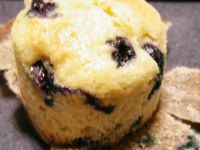 I wonder when I would be able to bake blueberry muffins with the blueberries from my balcony garden... Maybe this summer? Oh I can hardly wait!! There’s a vendor who sells this Pikachu kasutera near the Izakaya I work at. 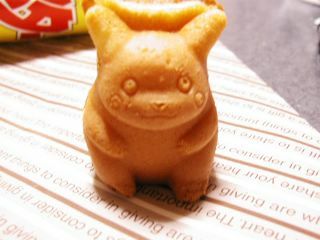 I don’t know what triggered me to go for it today, but I came home with a bagful of these cute yummies (500 yen a bag). They were still warm when I got home. Look at the closeup. 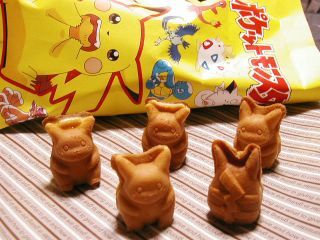 Yeah, they are too cute to eat. BTW, there's another vendor near the Izakaya who sells Doraemon Kasutera. I might try them, too, someday. 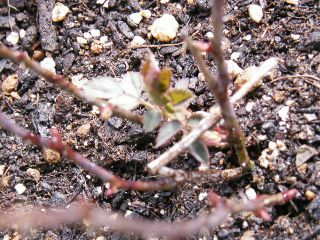 It has been terribly cold and windy for the past 2 days so I thought my plants were probably frozen to dath. 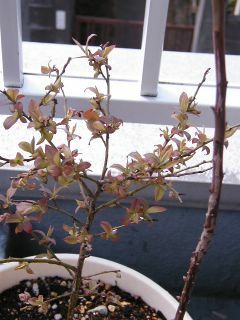 I saw today, however, the young leaves are growing OK in my balcony garden, telling me it’s spring now. Maybe I should go look for early cherry blossoms somethime this week. Yep! 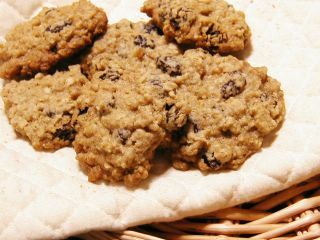 I tried out MrsT’s Chewy Oatmeal Raisin Cookies resipe. They look pretty nice, I think. Actually, they turned out rather crunchy than chewy ;P I guess I baked them a bit too long. Usually I need to bake longer than the baking time said in almost any recipe, because my oven is so small, old and not very powerful. Maybe it didn’t apply to this recipe. Anyway, they taste pretty good. Next time I’ll watch the baking time and might add some honey to make it more chewy. My cookie jar looks so happy to be filled up with these yummy cookies. This was my humble accomplishment of last weekend. Sorry, I’ve been too lazy to blog until today. 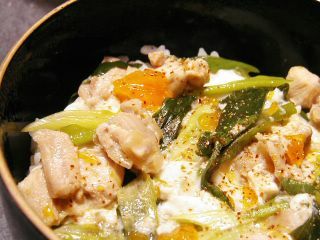 What's in the photo above is what we call Oyako donburi (chicken and egg bowl) here. 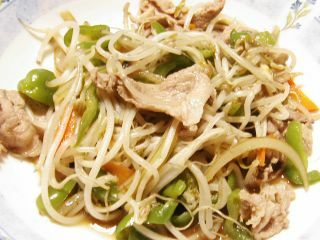 Oyako means “parent and child,” and this dish got its name obviously because chicken and egg are used for the topping. 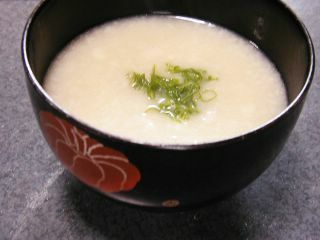 It is important not to overcook the egg and add something green---like green onion or mitsuba. 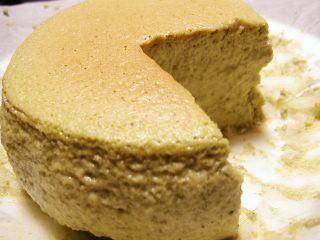 I also made Rachel’s Fuwa Fuwa Soy Milk Cakey --- matcha version, this time. Again mine turned out very soft, but better than my last attempt. At least, it came out from the small cake tin alright this time. I liked the taste, but could have added a little more matcha. 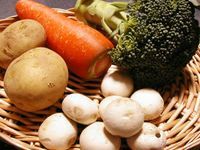 White Stew or Cream Stew? Honestly, I’m not sure what I should call this. 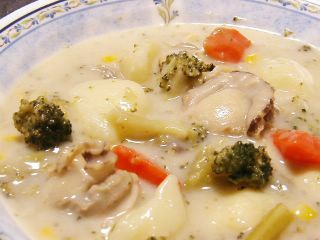 White Stew? In Japan, we call this “Cream Stew” --- that’s what it says on the package of the roux. Anyway, when I found all these vegs at discount, I felt as if they were all pushing me to make this dish. It was a nice day off today, after all. I did have a little exercise, walking along the river (in the rain). Also I painted a watercolor, which I haven’t done for months! Now I’m going to take a sip of nice white wine and go to bed early. 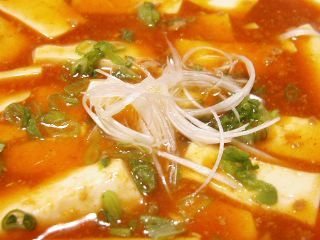 BTW, in Japan we call this "Mabo Dofu."